Whether you want to dress as Beauty and the Beast from the animated classic or the live action movie we’ve found the best Halloween costumes for the whole family to wear! Beauty and the Beast is my all time favourite Disney animated movie so I was super excited to see the new live action version this summer. 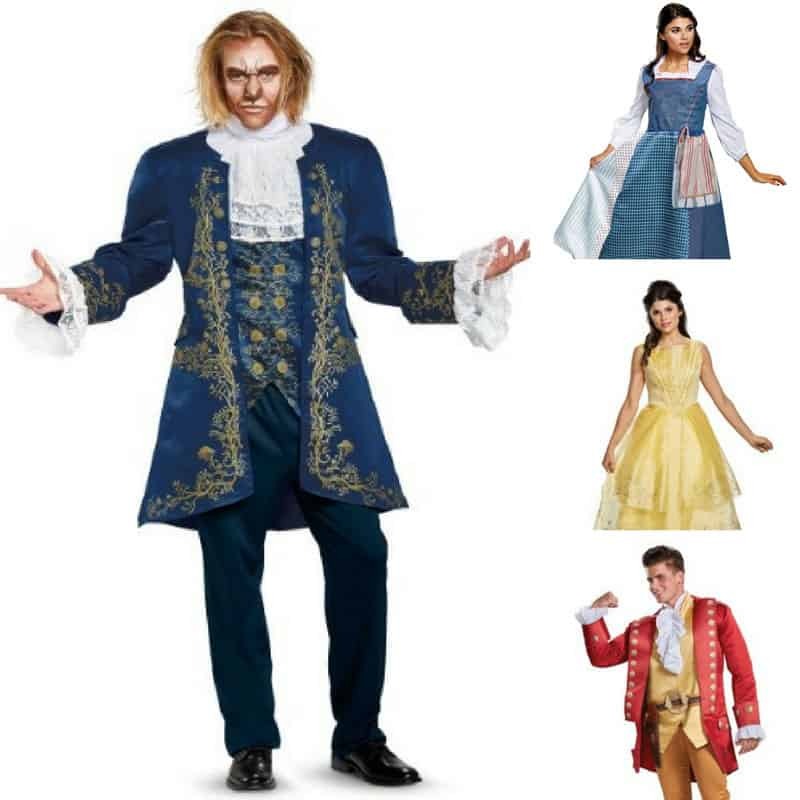 I think they did a fabulous job of bringing all the characters to life, and it got me thinking about how you could have Beauty and the Beast costumes for the whole family for Halloween! The Beast is a great option for any guy who wants to look princely, yet tough on Halloween. Boys will love dressing as the Beast too. There are costumes available for both the new adaptation for the Beast, and the older 1991 version. In the 2017 Beast’s outfit, he wears a blue coat with a matching vest, a white cravat, and grey pants. He has brown fur with backward, curved horns. The older Beast outfit consists of a purple coat over a gold vest, a white shirt, and black pants. 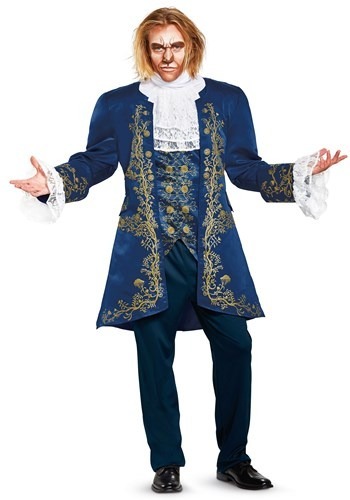 This costume doesn’t come with a mask so your guy can be the Beast “after” he had his makeover when he tries to woo Belle! This costume is officially licensed and I love the blue with the gold brocade trim. You’ll need some face paints to complete the Beast look. This version of the costume is based on the 1991 animated Beast and does come with a mask so your guy can totally look the part. The main differences in the older Beast are that his head is much larger, his facial features are much more expressive and animated, and his horns curve forward. The masks available for the Beast differ in levels of quality and detail, from plastic half-masks to full, 3D faux fur masks. Belle has two main outfits throughout the movie that you can find costumes for. The first one you see in the movies is her everyday outfit, which consists of a blue dress, white shirt, and white apron. She also keeps her hair back in a ponytail in this outfit. The 2017 version has a more vintage look that the 1991 animated costume. Her other outfit is a grandiose, yellow dress with no straps. Belle’s outfit has gone through almost no change between the 1991 version and the 2017 version because Disney recreated her animated ballgown in real life to a tee. This village dress is based on the 2017 live action movie and looks just like the one that Emma Watson wears. It’s a one piece dress that looks like a skirt and blouse, and the tea towel attaches to the front. You’ll want to wear some brown boots to complete the look. 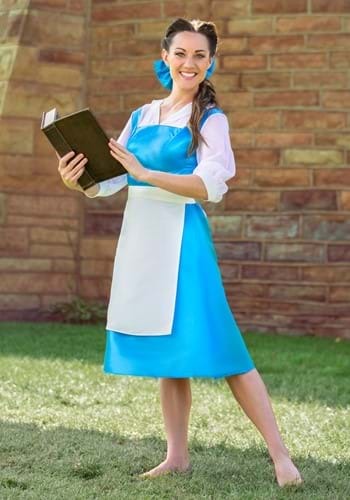 If you’d prefer to look like Belle from the 1991 animated classic then this is the Halloween costume choice for you! Slip on some black heels and be sure to carry a book! 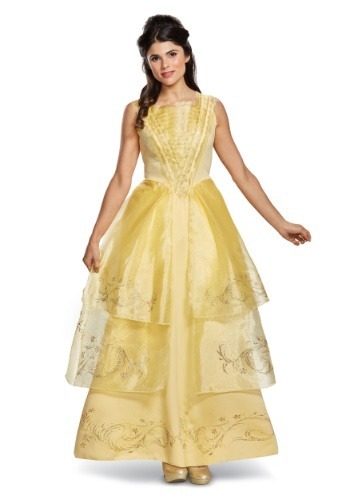 If you want to go as a Beauty and the Beast couple to a Halloween party you will need to wear Belle’s iconic gold ball gown. This dress has a solid base layer with glitter sprinkled sheer layers that will sparkle as you dance! 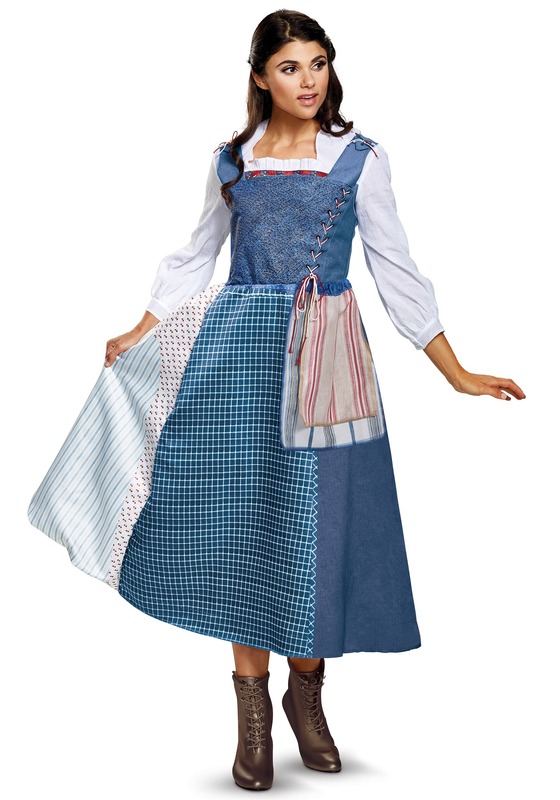 There are a few different styles of Belle costume for girls for toddlers through to tweens. If you don’t want to dress up as either of the main characters in the movie, there are costumes available for side and minor characters as well. For example, your guy could be Gaston, the manly man who tries to woo Belle with no success, or Lumiere the cheeky enchanted candlestick, or of course Cogsworth the grumpy clock!